Most of us have at one time or another, gathered our most cherished designer children’s items and taken them to a store that buys and resells, only to be dismayed by how little cash they have offered. Boutique owners face the same dismay as they are faced with giving away overstock or past season items to liquidators for barely pennies on the dollar. This is where “Upscale Consignment” comes in. Consignment returns to the consignor a percentage of the final selling price and not a low-ball up front cash offer where the buyer is assuming the risk of sale. We provide an alternative to buy and resale chains by providing you with an atmosphere and setting that is upscale in nature to present your higher end items for sale. This enables you to earn the highest possible return for your items and consigning puts more money back in your pocket. Why should I buy consignment? At Sweetpeas we can certainly appreciate the challenges and expense of outfitting yourself through pregnancy as well as the subsequent years of outfitting and entertaining your growing children. We offer top quality, boutique and brand name, like new and gently used items at affordable and reasonable prices everyday. Our selection is always changing as new inventory is added daily. 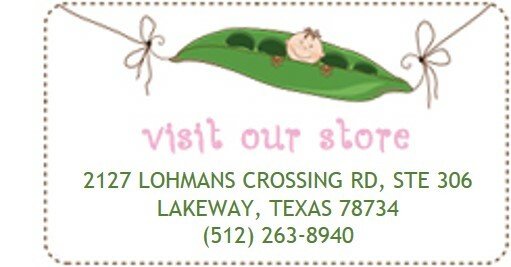 You also get the pleasure of shopping in an upscale boutique setting without the boutique prices. Are you particular about what you accept? Absolutely!!! Please keep in mind there will be items we will not be able to accept due to brand, style, condition or demand from our customers. Please understand these choices are part of what makes our establishment a success for you as both a consignor and a customer. Are there any specific brands that you look for? / Are there any specific brands that you do not accept? Yes; please refer to our list below. Although it is not comprehensive, we hope it will provide a helpful guide for what we generally accept and do not accept. Children's Brands We Love: Abercrombie, Baby Bjorn, Baby Lulu, Baby Gap, Cach Cach, Cakewalk, Catamini, Clayeux, Combi, Ergo Baby, Gymboree, Hanna Andersson, Hartstrings, Hollister, Jacadi, Janie & Jack, Juicy Couture, Justice, Lands End, Luli & Me, Maclaren, Mini Boden, Neiman Marcus, Nike, Oilily, Peg Perego, Petit Bateau, Ralph Lauren, Tea, Tumbleweed, Under Armour, Volcom, ZaZa Couture and MORE! Maternity Brands We Love: Cadeau, Chip & Pepper, Citizens of Humanity, Habitual, Japanese Weekend, Joe's, Juicy Couture, Maternal America, Michael Stars, Olian, Paige, Pea in the Pod, Rock & Republic and MORE! Brands We Do Not Take: Arizona, Basic Additions, Carters, Champion, Cherokee, Circo, Faded Glory, George, Gerber, Okie Dokie, OshKosh, Xhileration, and the likes.